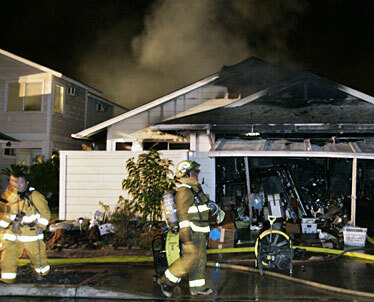 EWA FIRE: A three-alarm fire damaged two homes last night on Waimomona Place in the Soda Creek subdivision. 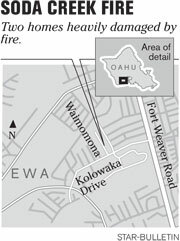 Honolulu firefighters evacuated a 61-year-old man from a three-alarm fire that gutted a house and heavily damaged a neighboring home last night in Ewa. Fire spokesman Capt. Robert Main said the man was in a front room of the home at 91-984 Waimomona Place but was unable to get out because personal belongings blocked his way. Firefighters found the man 3 feet from the front door. He refused treatment by paramedics. Fifty firefighters battled the fire, which was reported at 9:02 p.m. The fire was under control by 10:15 p.m. Eight engine companies and three ladder trucks responded to the fire, which was fully involved when firefighters arrived. The fire was upgraded to three alarms and a mobile command center was sent to the scene. Linda, a neighbor who wouldn't give her last name, said an elderly woman was rescued from the neighboring home that was heavily damaged. She said her son noticed a small fire between the two houses about two hours before the fire started. She said her son thought it might have been a barbecue because it didn't grow in size. The American Red Cross was assisting the residents displaced by the fire.